The Rico Reed Case-the only case designed to work with the Reed Vitalizer Automatic Humidity Control System (HCS). Fits all sizes of clarinet and saxophone reeds. Each case holds 8 reeds on a flat surface with channels designed to allow proper air flow. 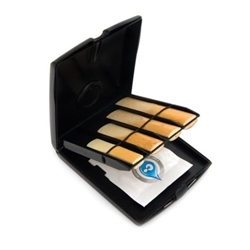 Simply insert the Reed Vitalizer pack into the lid, and your reeds are guaranteed to be stored at the proper humidity level. The Rico reed case is the only system that offers 2-way humidity control. Each Reed Case comes with one Reed Vitalizer 72% control pack. Holds 8 reeds of any size. Flat surface with channels for proper air flow. Includes one 72% Reed Vitalizer control pack. .